The Tightpants Lifemodel – Love. Life. Practice. Sorry. These metaphors occur to me. It’s congenital. One day, you wake up, and you put on your favorite pair of jeans. Except there’s one problem: the jeans don’t quite fit anymore. They’re a little too tight. In fact, now that you think of it, they’ve been snugging up for a while now, and the subconscious intake-of-breath that’s enabled you to button them closed the last few weeks has suddenly turned into a self-conscious sucking-in-the-gut that puts an awful lot of faith in the strength of that particular button. 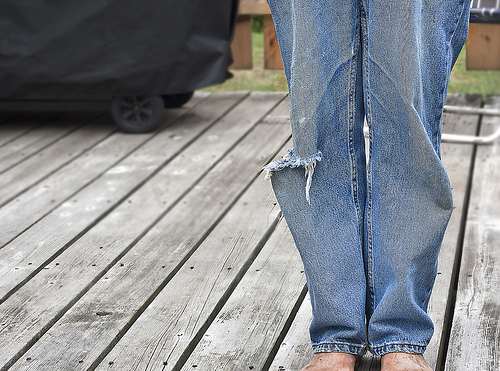 You gotta face it: the pants just don’t fit any more. Thankfully, just like life, this is a 3-D Surround Sound Choose-Your-Own-Adventure moment! Option 1: Throw the Rascals Out! These were old jeans anyway! You deserve new jeans, as hard as you work, and the new ones won’t have that worn spot on the left knee or be fraying at the hem. Oh, sure, these old jeans were comfortable, soft, pretty much totally fitted to your body, but the new ones will have that new-jean smell, and after a few washings and wearing them around town, the new pair will fit pretty well. Just takes some getting used to. The fact is, everybody outgrows things, right? Admittedly, it’s more fun when the growing is in terms of height rather than width, but…isn’t it important that your jeans be comfortable? You’ve got the opportunity to move beyond these old, ragged, too-small jeans and acquire a brand new just-off-the-line pair of stylish form-fitting denim icons of American freedom. While it would be nice to blame it on the jeans, the fact is, they’re pretty much the same size as the day you bought them. The fact is, it’s your waistline that’s been growing, and while that might be due to some happy and positive thing – say, increased muscle mass due to your daily core-strength workouts, or the start of your second trimester – it also might be due to that holiday feasting that started November 14th and shows no sign of stopping. It might be due to the amount of time you’re spending sitting down. It might be due to your reacquaintance with the fruits of the New Glarus Brewery. More to the point: do you really have the money to spend on jeans? Aren’t there other things you’d rather have? People you’d rather spend that money on? Perhaps this is the wakeup call, the opportunity to explore terms like “portion control” and “negative reinforcement” and “slow food.” Yes, it’s a slower process, but in the long run won’t it be better? In fact, maybe you can start working towards that mythical goal of the six-pack, there was a magazine that promised it in six weeks…buying a new pair of jeans is giving up! There’s no reason why you shouldn’t still have exactly the same body that you had before! Before when? Before your pants stopped fitting, of course! Metabolism? Pshaw! Time management? Sleep is for the weak! Starting tomorrow you’ll get up an hour earlier and do Insane Crunchy Booty Zumi 900Xtreme, or whatever it’s called, until you lose all those extra pounds that your recent habit of “relaxation” has gained you. Option 3: Would You Like a Break? These are really great jeans. They’re really still in pretty good condition, and you remember reading somewhere that looking good is less about weight and more about wearing clothes that fit you well. So you look in your local listings for someone to give you a hand, particularly with scissors and thread. Perhaps this person can help your jeans fit you better, keeping the familiar comfort of the worn-in material while adjusting the waistband to something more comfortable. There’s a little fear that the tailor may end up judging you – but when you meet with them, there’s no tsk-tsk as they measure your waist, no judgement in their eyes as you hold up the mildly ragged jeans. Suddenly the word “alterations” seems much less scary, in fact, a bit welcoming. They seem to understand both why you want to keep them, and also why they don’t fit as well. Not only can they make the waistband bigger, they say, but they also can put in a reinforcing gusset to help some of the more worn parts last longer. You didn’t even notice it until you tried the altered jeans, but they not only fit better than the day before – they fit better than you’ve ever felt them! Kind of makes you want to go for a walk around the neighborhood, in fact, in your lovingly cared-for jeans. Ignore it. Once they’re buttoned, they’ll hold. Yeah, it’s uncomfortable, and makes you less likely to bend down to pick up things like shiny pennies or blooming daisies or playing grandchildren – but if you just refuse to acknowledge the change, it won’t have actually happened. Everything will be just the way it’s always been. And the inches of your waist. Frankly, the only “bad” choice I can see above is #4. Change happens, and pretending it doesn’t is as silly as an NRA Press Conference. But I think that any of the other choices can be a right one, as long as you’re fully aware of why you’re making them. I know people who have cast off entire lives because they no longer fit, and I know others who have quietly grown themselves into lives of creative stability with only the materials at hand. Me, I just hope to occasionally offer services as a tailor, as it were. Congratulations on surprising me. I thought a Captain Mal reference was inevitable. I would do 1, 2 & quasi-3. Buy a new pair while keeping the old (cause having two is better than just one). Watch my diet and be a bit more active. And hey, I have skirts and dresses I haven’t worn in so long; they could use some love. The real dilemma is, after a month or two of my strategy, if my old jeans still don’t fit, do I hold out hope or accept my new normal.